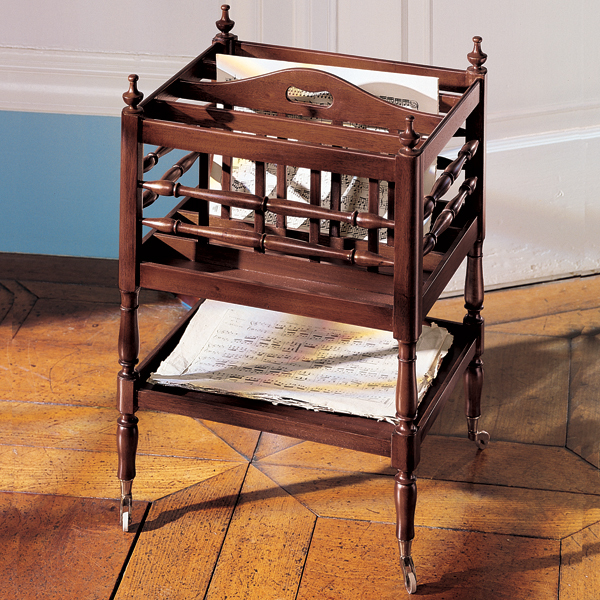 The Jefferson family kept favorites from their enormous collection of sheet music in a portable rack called a Canterbury. This reproduction shows the Canterbury is still quite handy, though you're just as likely to use its four compartments and lower shelf for magazines, newspapers or frequently used files. The casters on the legs and handgrip at the top make it easy to move around. A memorable gift for a musical friend. Mahogany, with brass casters. Imported. 22"h x 15 1/2"w x 13"d.
From the last decade of the eighteenth century though the 1830s portable racks, designed to hold sheet music and music books, became a fashionable addition to American parlors. This type of decorative music rack is called a �canterbury� because, according to Thomas Sheraton, the Bishop of Canterbury was the first to order one. Furniture like this would have been particularly useful in the Monticello parlor. The family had a very large collection of sheet music. When not purchasing music himself, Jefferson was encouraging his family to buy it when they traveled. 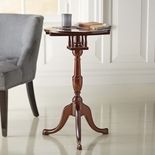 Sophisticated design and turnings suggest that Jefferson�s canterbury was made in England. It has four compartments for music and a lower open shelf. Corner pieces, each topped with small turned finials, extend into turned legs ending in brass casters. According to Sheraton, the casters and the �hand hole� at the middle divider allowed the canterbury to be �run in under the pianoforte�. Jefferson�s canterbury was inherited by Virginia Randolph Trist. In spite of the fact that Virginia was not inclined to practice as a child, she and her sister Ellen Randolph Coolidge were the most gifted musicians among Jefferson's grandchildren. 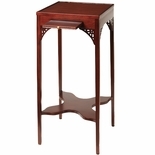 Our mahogany reproduction captures the style of and grace of the original in the collection at Monticello today.